One of the allures of Native American art is that everyone regardless of ethnicity can find something interesting in its imagery. Native American art can depict the past, a simpler way of life, but when it goes contemporary the viewer can see social issues evolve to meet the needs of a current society. Native American artists Steve Tamayo and Donel Keeler understand the past, and by using innovative techniques and found materials, they present a refreshing view on a very traditional subject. Their work in the two-person show, Traditions Transitioned, on display currently at RNG Gallery in Council Bluffs, reflects a diversity of interests and new directions for this art form. The exhibit offers the opportunity to study and debate the origins of materials and technique as well as the interesting use of traditional mediums in a contemporary style. In “Oldies, But Goodies,” Tamayo presents a lighthearted modern interpretation of Native American footwear. The light tan moccasins made out of ceramic are richly detailed with light and dark blue painted beadwork and adjustable bow ties at the top of the shoe. With “Buffalo Spirit,” you can see the influences of his heritage within this piece. The piece consists of a painted old bull buffalo skull. The top half of the skull is painted black depicting a ghostly buffalo, while the bottom part of the skull is painted bright red accented with white designs. The skull is filled with sage. When looking at the sky the viewer can see a bright yellow orb in the vivid blue background with drifting buffalo clouds low on the horizon. The colors are gorgeous – the blues, yellows, oranges, and browns jump off the canvas. “Parfleche Design” is an architectural arrangement of what looks like an up-close detail of a patch of beadwork from a piece of clothing. The most impressive feature Keeler seems to focus on is his choice of colors. The canvas looks like fabric and the bright turquoise and deep red juxtaposes with the tan canvas. It is a simple painting, but it boasts much texture and shading. 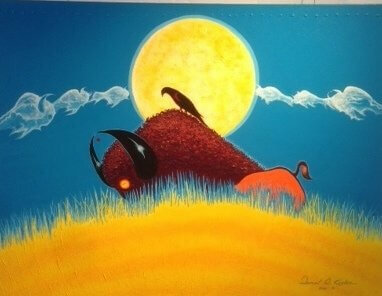 “I mainly use acrylic paint to present subjects like buffalo, horses, native hunters and other aspects of native life. I go back in my Native American background and bring back the history that I was told,” he said. Native American art can reflect the customs of its various tribes by intertwining popular culture along with their contemporary view to historic themes. These two artists present the complexities of the Modern Native American experience and allow the viewer a glimpse into the nuances, meanings and perspective of identity that focuses on their heritage. Traditions Transitioned continues through February 1st at RNG Gallery. 157 West Broadway, Council Bluffs, IA. For details, go to dixiequicks.com/category/rng-gallery or call 712-256-4140. A Valentine’s Day Evening Fit for the Gods!Taxes and Medicaid and Mountain Lions? Oh, My!